Migration and the relocation of the population interacts with education in many ways. These links affect those who move, those who stay and those who shelter immigrants, refugees or other displaced populations. In this context, the latest Unesco report, "Global Education Monitoring 2019", shows how immigration has affected the outgoing and remaining education of the population. Loss of talent can become real danger to poor states cites the report. Loss of human capital, a phenomenon known as brain drain, may adversely affect poorer countries. This report suggests that immigration rates of highly qualified persons are over 20%, up to about a quarter of the 174 countries, including Grenada and Guyana in the Caribbean, Albania and Malta in Europe, and Eritrea and Somalia in Africa. The Unesco report also points out that the form of scholarships in the donor country or the predominantly western universities can aggravate this trend, because in most cases students do not return. The report emphasizes that students or universities in the region should be supported. 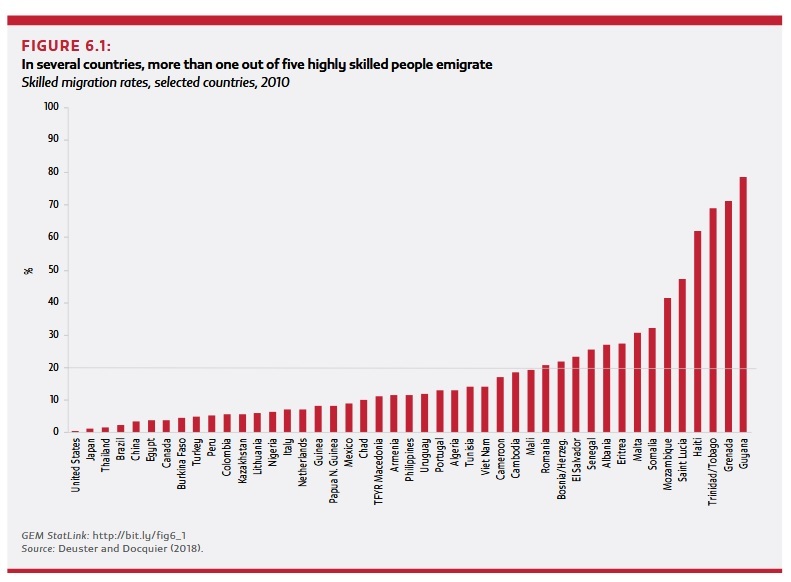 Albania has one of the highest rates of emigration. In 2015, around 2.9 million Albanians lived in the country and 1.1 million resident abroad. The financial crisis in Greece and Italy, which accommodated almost 80% of Albanian emigrants, caused a wave of returns. A study showed that 70% of male returnees had lost their jobs abroad. Between 2008 and 2014, it is estimated that from 150,000 to 180,000 Albanian emigrants returned, mostly from Greece. As a result, the Albanian labor force expanded by 5% between 2011 and 2014. The analysis of the labor force survey data shows that returnees contributed to an increase in employment rates, both through self-employment and employment through new businesses. The returnees are more likely than non-migrants to create businesses and bring non-migrants to the workforce. Professional Centers provide opportunities for entrepreneurial education, often with the support of development partners. In 2010, the Kosovo government and Albania developed a five-year reintegration strategy, enhancing the incentives for returnees to engage in public services, in professional centers. The Employment and Skills Development Strategy 2014-2020 also recognized the challenge of supporting returnees. However, in the years 2011-2015, only 800 returned from emigration came to the counters for professional orientation. Expanding this service at the municipal level requires improving access, but also consistency with the strategy needs to be increased. Moreover, professional centers may no longer be appropriate for entrepreneurship training for returnees, but needs a proper strategy for them.